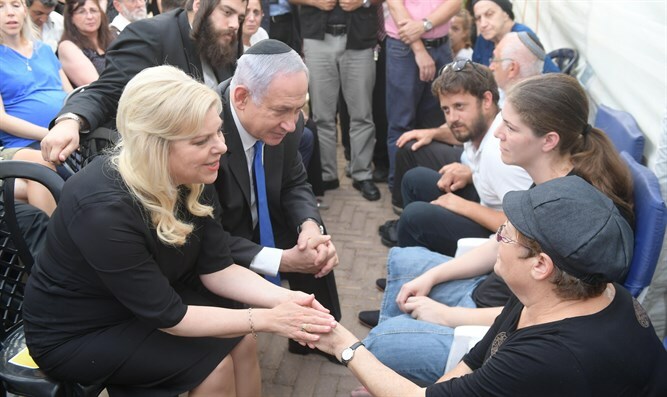 Prime Minister Binyamin Netanyahu on Thursday called for the 19-year old Arab terrorist who slaughtered three members of the Salomon family on Friday to be executed. The statement came during the Prime Minister’s visit to the Salomon family in Elad, as they celebrated the circumcision of a new grandson. Last Friday, Yosef Salomon, 70, his daughter Haya, 46, and his son Elad, 35, were stabbed to death by an Arab terrorist after he broke into their house during a family celebration in honor of the grandson’s birth. “The time has come to use the death penalty for this terrorist,” Netanyahu told the family. “This is permitted by the law; it needs a unanimous decision by the judges, but they’ll want to know the position of the government as well. And my position is as Prime Minister, that in this case, of this lowly terrorist, that he should be executed. He simply cannot be allowed to smile again,” Netanyahu said, referencing pictures taken of the terrorist smiling shortly after the attack.